The emphasis of this week's Newsletter is the corruption and violence that fills the earth "as it was in the days of Noah." True believers will recognize the cosmos is falling apart. There is no hope in this world because grace will end with the Gentile dispensation and the God of Abraham, Isaac and Israel has instructed us to "let evildoers continue doing evil, let he who is filthy remain filthy: and the righteous still do right, and the holy continue in holiness." It should be obvious to all with eyes to seethis is happening now in our governments which care not for their electors as they are serving the seed of the Serpent in anticipation of Lucifer's soon-coming totalitarian one world governmenta continuation of the old world order. We look for a renewed world and a City right here now in a dimension faster than this. Our main article contains numerous links that demand careful study. It concerns subversion and self-condemnation within the circle of this Message; a form of godliness that influences the non-elect but denies the faith and misleads those who are forever trying to learn and never able to attain the faith. We praise the Lord for this sign which demonstrates God's elect will not be deceived on His revealed Word, and warn of the closeness of the Pentecostal jubilee. In a few days on the eleventh anniversary of the internal false flag 9/11 black op BIG LIES will be regurgitated worldwide. But for those interested in truth this issue has a link to THE 9/11 READER. Tomorrow, September 8, our Brother, Pastor Youcef Nadarkhani will again appear before the court in Iran. Please up hold him and his family, his attorney, and other believers in Iran before the Lord. August 29, 2012  With the US now openly arming, supporting, and literally "cheering" Al Qaeda in Syria, it is clear that the 'War on Terror' is an unprecedented geopolitical fraud perpetuated at the cost of millions of lives destroyed and an incalculable social and economic toll. NATO, with full knowledge of the consequences is literally carving out of North Africa and the Middle East; the so-called "Caliphate" Western leaders had held over their impressionable people's heads as the impetus to perpetually wage global war. Torn from the pages of Orwell's 1984, an artificial war has been created to carry forward corporate-financier machinations both abroad and domestically. The so-called threat to Western civilization is in fact a foreign legion of Western corporate-financier interests, executing Wall Street and London's foreign policy on a global scale where, and in a manner traditional Western forces cannot. NATO's terrorist blitzkrieg across the Arab World will not end in Syria. It will continue, if allowed, into Iran, through the Caucasus Mountains and into Russia, across China's western borders, and even across Southeast Asia. The price for ignorance, apathy, and complicity in supporting the West's so-called 'War on Terror' will ironically reap all the horrors and then some in reality, that were promised to us if we didn't fight this "Long War." Our support of both the political gambits of our politicians, as well as our daily patronage of the corporate-financier interests driving this agenda have already reaped an unprecedented and still growing regional safe haven for terroristsand as moderate secular governments continue to be undermined and toppled, we can only imagine the blowback, retaliation, and other consequences as this destructive foreign policy unfolds. To imagine that such meddling will not end up being visited back upon us, even if in the form of a false flag attack dwarfing 9/11, would be folly. . . Comment: This and other issues such as the APEC Summit are discussed with President Putin whose moral principles are commendable. What Ayatollah Khomeini called "The Great Satan," Jesus Christ calls "The image to the beast" (Revelation 13:11-18)what you call "America" or the Jewnited States, a colony of the 'City of London' realizing its program for World War III between political Islam (a 'City' construct of opportunists and fanatical Islamic "useful idiots") and political Zionism (a 'City' construct of opportunists and fanatical Jew and 'Christian' "useful idiots"). Paul said "God will send them a strong delusion to believe the lie: that all might be damned who believe not the truth but have pleasure in unrighteousness." Brother Branham declared they will become "atomic fodder". September 4, 2012  In 1992, an internal Chinese government document said that America's "strength is in relative decline and that there are limits to what it can do". . . this "perception" of US military decline has only been heightened as the Wall Street-London financier model of "economic growth" has been revealed as an untenable global Ponzi scheme versus the Chinese model of industrial production and infrastructure expansion. The military might required to contain China is also politically and economically unjustifiable, and increasingly so. It appears possible at least, that US policy makers are committed to a losing strategy based on inaccurate interpretations and projections regarding the collapse of the Soviet Union and its comparison to the Chinese. US policy makers have led the populations of Western civilization down a dead-end in pursuit of global hegemony instead of one of economic and technological progress. . . .
Clearly, by "open markets" and American firms' ability to "tap into the vast and growing consumer base of Asia," we see an overt declaration of intent for Wall Street and London's corporate-financier interests to overrun and dominate Asian markets with the same monopolies they have pillaged and exploited their own populations with devastating socioeconomic consequences. August 7, 2012  The world's epicenter of capitalism is the United States; its reach/power/influence circumnavigates the globe. . . The notion that a company or corporate executive or wealthy entrepreneur is bound by an allegiance to their country of origin is passé. The elite capitalists of today are bound to one another, not to countries. . . This global ruling class controls the levers of an emergent trans-national state apparatus of global decision-making and orders emanate from the IMF, World Bank, EU, and WTO. The ruling bloc of this world order consists of chieftains of global corporations and financial conglomerates, major players in the dominant political parties of the world, media conglomerates, and technocratic elites . . . Frankly, the multiplicity of the financial problem is the problem! The world of finance is a mind-boggling complexity of derivatives overlying derivatives superimposed upon CMOs interlocking with CDSs and residing within the depths of major brokerages and banks, deep in their vaults for nobody to see in full living color. The legendary investor Sir John Templeton summed up the financial monster in two words, writing a memorandum to close friends and family before his death, as he anticipated the future, "Financial Chaos." World banking/finance is a multi-headed hydra monster of global proportions that may bring the world of capitalism down to its knees, prompting police state intervention to maintain social order. The early stages of this phenomenon have already appeared, and historians may one day earmark the summer of 2007 as the start of the Age of Financial Calamity! Transnational capital has been able to break free of nation-state constraints to shift the correlation of class and social forces worldwide sharply in its favour and to undercut the strength of popular and working class movements around the world. One new structural dimension of 21st century global capitalism is a dramatic expansion of the global superfluous population . . . marginalized and locked out of productive participation . . . constituting some one-third of humanity. The need to assure the social control of this mass of humanity living in slums gives a powerful impetus to neo-fascist projects and facilitates the transition from social welfare to social control, otherwise known as police states. Over time, this system becomes ever more violent and the ability of economic power to determine electoral outcomes opens the door for 21st century fascism to emerge without a rupture in electoral cycles and/or a constitutional change. Comment: Brother Branham said, "There's three isms, Communism, Fascism, and Nazism. They'll all wind up out of Russia in Communism, and it will destroy Catholicism" (The Voice of the Sign, p. 116; Revelation 16:116). June 24, 2012  Based on this declaration it seems the Muslim Brotherhood's Egyptian President Mohammed Morsi wants to fight the pope and America's Jewish president Obama for Jerusalem, when he is in fact an obedient servant of the 'City of London' executing their plan to force the 'hot stage' of World War III between political (not spiritual) Islam, and political Zion (apostate Jews and 'Christians'). The Muslim Brotherhood was created by the Royal Family's MI6 and controlled by the 'City' like Zionism, while al Qaeda is a CIA front. Both sides of the Hegelian dialectic are controlled by the same identity. Full story: youtube.com. September 3, 2012  "A high-ranking Sinaloa narco-trafficking organization member's claim that US officials have struck a deal with the leadership of the Mexican 'cartel' appears to be corroborated in large part by the statements of a Mexican diplomat in email correspondence made public recently by the nonprofit media group WikiLeaks." February 3, 2012  France's Jewish past President and MOSSAD agent Sarkozy, has been calling for forced immigration, integration and assimilation in all white countries, and only white countries, shown intent to destroy the white race. This is the racial genocide touted by Rabbi Emanuel Rabinovich, speaking before a special meeting of the Emergency Council of European Rabbis in Budapest on January 12, 1952, ". . . We will openly reveal our identity with the races of Asia and Africa. I can state with assurance that the last generation of white children is now being born. Our Control Commissions will, in the interests of peace and wiping out interracial tensions, forbid the whites to mate with whites. The white women must cohabit with members of the dark races, the white men with black women. Thus the white race will disappear, for mixing the dark with the white means the end of the white man, and our most dangerous enemy will become only a memory . . ." (William Guy Carr, Pawns in the Game p. 104-106). Comment: This policy of the 'City of London' is why the best politicians money can buy are inviting inassimilable races, religions and cultures into their nations "to fill the earth with violence . . . as it was in the days of Noah" (Genesis 6:13; Matthew 24:37). I feel as if I am back in the USSA. This morning I received an email asking the rhetorical question "Is our prime minister a crook?" To which the writer's diplomatic response was, "Who knows what is real or notbut interesting stuff! This is red hot, listen before it is removed." And attached a URL to Alan Jones' thirty-minute interview with Michael Smith on the four-year relationship of Prime Minister Julia Gillard with Bruce Wilson, who misappropriated union funds. As a matter of public importance 2GB has provided a transcript of the July 20 interview. For all who may be interested, [Fairfax Journalist] Andrew Bolt ran an abbreviated version of this story yesterday at 10:00 am. At 11:30 am yesterday he got two death threats and a separate phone call from Paul Howse current AWU secretary telling Bolt that the AWU intended to sue Bolt. This morning the TV station hosting 'The Bolt Report' was told that it could expect 'all sorts of trouble from service suppliers and transport companies servicing the network unless it retracted the story and sacked Bolt'. Some have saiddon't be surprised if Alan Jones meets with a nasty 'accident'. > "I am sure you have come across the links included below on the accusation that WMB plagiarized Dr. Larkin's work on Seventy Weeks, Seven Church Ages and the Seven Seals. At first I did not have words and I am now really interested in your take on the whole thing. Also of importance is the issue of the difference in dates pertaining to the Cloud's appearance and WMB's hunting trip believethesign.com. Seek Ye The Truth Forum claims to be "A place for current and former followers of William Branham to help each other grow in Christ." Conversely it appears to be a cage where "ye of little faith" encourage mutual unbelief. "In all of his epistles Paul spoke of some things that are difficult to understand, which the ignorant and unstable twist to their own destruction, as they do the other Scriptures" (II Peter 3:16). Brother Branham states that before he taught these series he read the works of men who had gone before him including Clarence Larkin, of whom he said, "I'm very grateful to Dr. Larkin of his views. I'm grateful to all these great scholars for their views on this. And in reading them, it enlightens me much that I can find places that looks right. . . But somehow or other, I thought I had a little view of it myself that might be of places different". The Prophet quoted Clarence Larkin verbatim, replacing his errors with God's revelation. This is not 'plagiarism,' it is simply quoting some of the good words of a saint from a previous Church Age. Should we now regard Isaiah 63:11-13 and Jesus' Sermon on the Mount (Matthew 5) as 'plagiarizing' Moses? Did Paul 'plagiarize' Aratus' poem "Phainomena" in Acts 17:28, Meander in I Corinthians 15:33, and Epimenides' "Hymn to Zion" in Titus 1:12? Are Joshua, Samuel and Jude guilty of 'quoting verbatim' and 'plagiarizing' Jasher and Enoch? Where does the legalistic line of self-righteousness stop? Sir Robert Anderson (1841-1918) is acknowledged as the most outstanding scholar on Daniel's Seventy Weeks prior to the Lord's revelation to Brother Branham. Brother Larkin's charts and artwork are his own work, however many earlier scholars blazed the trail of exposition for him to follow. Thousands have been motivated by such witnesses vindicating the Supernatural in Brother Branham's ministry. Now, pork pie! Is God's grace to be employed as 'bait' for yet another preplanned Hegelian dialectic by the enemy of God and man that dominates both thesis and antithesis in our controlled party political Hegelian sham democracies? Plans war, manipulates capitalism, Zionism, Communism, Nazism, libertarianism, feminism, humanism, Masonry, Judaeo-Wahhabi Islam, Judaeo-Roman Catholicism, Mormonism, Jehovah Witnesses (so-called), denominationalism, trade unionism, education, media, entertainment, United Nations, banking, finance, international affairs, narcotics, and so-called law through the BAR, to divide and conquer a kingdom for Lucifer? Was this a subterfuge to elevate the shallow-minded religious majority satisfied with illusory spiritual ambience, knowing they will not study to make their calling and election sure, then dash them to earth with falsehood concerning the Prophet and his Message, so that without compass and still failing to "prove all things" these disillusioned "fallen angels" become Satan's unwitting servants (Psalm 105:15; Hebrews 6:4-6)? > "I DEEPLY appreciate your explanations [to other believethesign conjectures]. I on my part came across this criticisms like a fortnight ago, and they were very unsettling to be honest. With the possibility that I could be holding to and preaching a false doctrine, I was literally reduced to a sobbing shell. I however remembered that GOD guides HIS own precisely into the truth and so chose to pray desperately about it, than 'argue' with people. > Yes Brother, I have been asking GOD to tell me the truth about all these things, because as touching eternal life it is foolhardy to employ carnal reasoning. Slowly by slowly I have gone through most of what this guys are complaining about and for the most part I have 'seen' a lack of sincerity and even intellectual honesty. Your explanations on plagiarism are particularly enlightening. I also thought of Jude's letter as Peter's work 'plagiarized' and it was humor!" We are each responsible to listen and read, then prove all things (Acts 17:11; Romans 3:4; 10:17; Galatians 1:8-9; I Thessalonians 5:21; Revelation 22:18-19). Yet few of the two billion nominal Christians can conjugate Matthew 28:19 and Acts 2:38, and most imagine God is three people, thus "God's people are destroyed for lack of knowledge" (Hosea 4:6) because rabbis, priests and mullahs "make the Word of God of none effect, teaching for doctrines the commandments of men" (Matthew 15:9). These often sincere natural men without the spirit are trying to do God a service without His will, and the detective work 'debunking' the ministry and Message of William Branham appears to be a classic illustration. It seems the Jew Jeremy Bergen and believethesign.com have preyed on the public ignorance of history in order to debunk the seventh angel and his Message which IS Jesus Christ, who said: "Offences will inevitably come: but woe to him by whom they come! It would be better for him if a millstone were hung around his neck and he were cast into the sea, than that he should cause one of these little ones to stumble" (Luke 17:1-2). Brother Branham would have said, "Their arguments are thinner than the broth made out of a shadow of a chicken that's starved to death." I will touch just four points in contention. 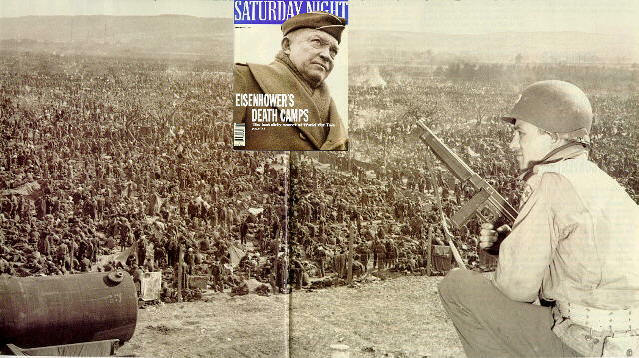 "In a speech before the Dallas, Texas, Alumni Club of Columbia University on Armistice Day, 1950, General of the Army [that terrible Swedish Jew] Dwight D. Eisenhower [who is guilty of the expulsion and genocide of nine to fifteen million German civilians from their ancestral homelands of East Germany and beyond towards and after the end of World War II] stated that as Supreme Commander in Europe he made a habit of asking American soldiers why they were fighting the Germans and 90% of the boys said they had no idea. Very specifically, General Eisenhower did not offer members of his Alumni Group any precise answer to his own question. The high point of his speech was a statement of his hope that Columbia might become the fountain-head for widely disseminated simple and accurate information which will prevent out country from ever again "stumbling into war" at "the whim of the man who happens to be president" (J. Beaty, Iron Curtain over America, p. 60). The military blueprint for World Wars I, II, and III was set in 1871. Hence Brother Branham said, "President Franklin D. Roosevelt took America to England's tea party. That's right. Germany never picked on us; we picked on them, throwed the whole world into a war, to cause a world war" (Condemnation by Representation, p. 6:41). It was planned that way eleven years before Roosevelt was born. The Jewish traitor Roosevelt created the Pearl Harbour incident as an excuse to declare war against Germany. "He was chiefly concerned with the planning and operation of his New Deal domestic policy down to 1937, even to 1939, but he did not forget armament and possible war, even diverting NRA funds to finance naval expansion, chiefly directed against Japan. In early January, 1933, even before he had been inaugurated, and against the urgings of Raymond Moley and Rexford G. Tugwell, he had accepted as the basis of his policy toward Japan the bellicose altitude of Henry L. Stimson which would have led the United States into war with Japan in 1932 or 1933 had Stimson not been checked by President Hoover's firm stand for peace, a situation explained to me in detail by former President Hoover. Whenever his domestic policy struck reverses and hard sledding Roosevelt turned to foreign policy with aggressive implications . . . With the outbreak of war in Europe in September, 1939, his aggressive foreign policy continued unceasingly until the attack on Pearl Harbor. Roosevelt's attempt to purge a no longer docile Congress in the election of 1938 proved an ignominious failure, and the New Deal appeared to be in a permanent slump. It obviously had not solved the depression. Nor had the increasing expenditures for armament succeeded in providing full prosperity. When war broke out in Europe in early September, 1939, this gave Roosevelt an ominous impulse and continuous inspiration. The war had hardly begun when, on September 11th, Roosevelt wrote [another Jewish traitor] Churchill, then only First Lord of the Admiralty, suggesting that they work together through a secret system of communication: "What I want you and the Prime Minister to know is that I shall at all times welcome it, if you will keep me in touch personally with anything you want me to know about. You can always send sealed letters through your pouch or my pouch." Churchill is said to have responded enthusiastically, including the statement: "I am half American and the natural person to work with you. It is evident that we see eye to eye. Were I to become Prime Minister of Britain we could control the world." A method of secret communication was agreed upon in which Roosevelt would sign himself "Potus" (President of the United States), and Churchill would sign as "Former Naval Person." About 2,000 messages were exchanged in this way prior to Pearl Harbor, and Churchill is our authority for the statement that the really important negotiations and agreements between Britain and the United States from 1939 to Pearl Harbor were handled in this way, all quite unknown to the American public. It has since become obvious that while Roosevelt was assuring this country of his peaceful aims he was also actually doing all possible in cooperation with Churchill to get us into war as soon as practicable. In addition to other sources, I have this information personally from Tyler Kent, the code clerk in the American embassy in London, who read all of this material from September, 1939, to the time of his arrest in May, 1941. Two telegrams that have been recovered from this secret correspondence indicate the tenor and objectives of their collaboration. Roosevelt told Churchill that the United States was firmly isolationist and could not be induced to enter the war in behalf of Poland. Churchill responded: "Every chain has its weakest spot and the weak link in the Axis chain is Japan. Goad Japan into attacking the US and you will have the US in the war." While this proved to be the strategy followed by Roosevelt, it is unlikely that the policy originated with Churchill. As Professor William L. Neumann has made clear in his America Encounters Japan (p. 235-230) this plan to enter a war with Japan, even to provoke Japan to war, was opposed by the overwhelming mass of the American people in the late 1930's. Even the annual conventions of the American Legion in 1937 and 1938 demanded "absolute neutrality." The Veterans of Foreign Wars started a campaign to secure 25 million signatures for a petition to "Keep America out of War." Even the Ludlow Resolution requiring a national referendum on the declaration of war only failed of passage because of the tremendous pressure exerted by Roosevelt through influential public figures. Despite the strong American isolationist sentiment, Roosevelt never really gave up hope of getting the United States into the war after October, 1937, first and directly in Europe until at least the end of July, 1941. During the spring and summer of 1941 he did everything possible to provoke Germany and Italy to produce some "act of war" in Europe or on the Atlantic that he could use to get the United States into the European conflict, especially through our illegal convoying of munitions and supplies to Britain and Russia, but neither Germany nor Italy would rise to the bait. He had not, however, neglected the possibility of war with Japan. The extensive and quasi-secret increases in the American navy after 1933 obviously pointed the finger at Japan. As far back as the winter of 1937-1938 he had sent Captain Royal E. Ingersoll to Europe to discuss with the English the possibilities of collaboration in the event of war with Japan. In January, 1941, Roosevelt and Hull rejected the amazingly generous Japanese effort to settle Japanese-American relations by peaceful methods presented by a commission with full Japanese authorization. The rebuff of this really sensational overture from Japan seriously undermined the hope of the latter in arriving at a peaceful settlement with the United States, but the effort was continued for over ten months. Japan offered to retire from the Rome-Berlin-Tokyo Axis in return for a guaranty of peace with the United States. The President is determined that we shall win the war together. Make no mistake about it. He has sent me here to tell you that at all costs and by all means he will carry you through, no matter what happens to him—there is nothing that we will not do so far as he has human power. Arrangements were also quickly made for joint-staff conferences with the British to arrange a plan for military collaboration: ABC-1. These were held in Washington from January through March, 1941 (Harry Elmer Barnes, Pearl Harbor after a Quarter of a Century, p. 14-17). "The Jews worm their way into every nation and, as business people, their first task is to establish and consolidate their influence in the economic sphere. After centuries of this process, the economic power thus gained leads to the adoption of severe countermeasures against the invaders by their hosts. This natural form of self-defense quickens the Jewish attempt to remove, by means of a camouflaged and slow process of assimilation, not only the main grounds for an attack on an alien race but also quickens their efforts to gain a direct political influence on the country in which they happen to live. Both of these dangerous evils are ignored, partly through economic considerations, and partly through an inherent bourgeois indifference. Furthermore, the warning voices of influential or intellectual circles are just as deliberately ignored. History teaches us that this is always the case whenever prophetic results have an unpleasant character. Thus, with the aid of the language which they have adopted, these Jews are successful in gaining an ever increasing influence on political development. Democracy then establishes the pre-condition for the organization of those terroristic elements known to us as Social Democracy, the Communist Party or the Bolshevist International. Whilst Democracy gradually stifles the vital forces of resistance, the advance guards of Jewish world-revolution are being developed in the radical revolutionary movements" (Arnold Leese, The Jewish War of Survival, p. 61). The one percent who are Communists in Russia are Khazar so-called Jews like the two percent that control the United States, Britain, Australia and the rest of the Western world. In 1937 and again in 1938 the German government made "a sincere effort to improve relations with the United States, only to be rebuffed" [like Japan's conciliatory offer on November 26, 1941Ed]. The US Government's alleged reason was "a fear of domestic political reactions in this country unfavorable to the Administration." Germany was told that the American public would not tolerate a conference. Some officials favored exploring the German offer "after the congressional elections in the fall" (1938). The sequel, of course, is that the Roosevelt administration blocked Germany's further efforts for peace by withdrawing our ambassador from Berlin and thus peremptorily preventing future negotiations. Germany then had to recall her Ambassador "who was personally friendly toward Americans," and according to the New York Times, "was known in diplomatic circles here at the time to be working for international understanding in a spirit of good will." Here, to repeat for emphasis, is the crux of the matter: The whole story of Germany's appeal for negotiations and our curt refusal and severance of diplomatic relations was not published in 1937 or 1938, when Germany made her appeals, but was withheld from the public until ferreted out by the House Committee on Un-American Activities after World War II and by that committee released to the press more than ten years after the facts were so criminally suppressed. Parenthetically, it is because of services such as this on behalf of truth that the Committee on Un-American Activities has been so frequently maligned. In fact, in our country since the 1930's there seems little question that the best criterion for separating true Americans from others is a recorded attitude toward the famous Martin Dies Committee. 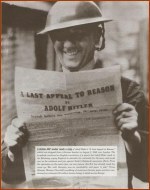 Economically strangled by an international [Jewish] boycott headed up in New York, and outlawed politically even to the extent of being denied a conference, the Germans in the late 1930's faced the alternatives of mass unemployment from loss of world trade or working in government-sponsored projects. They accepted the latter. The workers who lost their jobs in export businesses were at once employed in Hitler's armament industries (see the special edition of the Illustrate Zeitung for November 25, 1936), which were already more than ample for the size and resources of the country, and soon became colossal. Thus by desperate measures, advertised to the world in the phrase "guns instead of butter," Hitler prepared to cope with what he considered to be the British-French-American-Soviet "encirclement." Stung by what he considered President Roosevelt's insulting language and maddened by the contemptuous rejection of his diplomatic approaches to the United States, he made a deal (August, 1939) against Poland with the Soviet Union, a power he had taught the German people to fear and hate. With the inevitability of a Sophoclean tragedy, this betrayal of his own conscience brought him to ruinand Germany with him. Such is the danger which lurks for a people when they confide their destiny to the whims of a dictator. The war which resulted from Franklin D. Roosevelt's policy is well remembered, especially by those American families whose sons lie beneath white crossesat home or afar. Its pre-shooting phase, with all the weavings back and forth, is analyzed in Professor Charles A. Beard's volume, American Foreign Policy in the Making, 1932-1940 (Yale University Press, 1946). Its causes are the subject of Frederick R. Sanborn's Design for War (Devin-Adair, New York, 1951). Its progress is surveyed in William Henry Chamberlin's America's Second Crusade (Henry Regnery Company, Chicago, 1950). "The English would never have contrived World War II if they had not been sure of Roosevelt's help . . . what is the net result? First, the Asiatic barbarians, held at bay since 1683 [when the Turkish attack on Vienna was repelledEd], have been let loose in Western Europe. . ." (H.L. Mencken, Life Magazine, August 5th, 1946, p. 46; Revelation 16:12). These historic notes vindicate Brother Branham's prophecy that the unclean spirits of Fascism and Nazism would be swallowed up by Communism. Communism is funded from New York and Moscow was ruled from New York City. Jesus called the spirit of the end-time Laodicea, or Judaeo-Communism. Brother Branham said, "Notice the name, Laodicea [means] 'the people's rights,' or 'justice of the peoples.' Was there ever an age like the twentieth century church age that has seen ALL nations rising up and demanding equality, socially and financially? This is the age of the communists where all men are supposedly equal, though it is only so in theory. This is the age of political parties, who call themselves Christian Democrats, and Christian Socialists, Christian Commonwealth Federation, etc. According to our liberal theologians Jesus was a socialist and the early church under the guidance of the Spirit practiced socialism, and thus we ought to do so today. It was a city of earthquakes; such earthquakes as finally destroyed it. This age will end in God shaking the whole world that has gone off to make love with the old harlot. Not only will world systems crumble, but the very earth will be shaken and then renovated for the millennial reign of Christ" (An Exposition of the Seven Church Ages, p. 320:1-3). "Satan is the sum of [intellectual wisdom or knowledge without revelation] and perfect in beauty" (Ezekiel 28:12). Brother Branham said, "Satan was the original archangel of God. He once dwelt in the heaven. He once was the greatest person in the heavens outside of God. He was God's right-hand man to fellowship, and he got puffed up in his heart" (COD, p. 375:69). "And the Lord commended the unjust steward, because he had done wisely: for the children of this world are in their perverse race wiser than the children of Light" (Luke 16:8). Satan and his children are certainly going about as a roaring lion, seeking whom they may devour (I Peter 5:8). We are at the end of the race almost up to the wire for the Pentecostal jubilee, and carnal dissemblers having infiltrated the circle of this Message with the hiss of the Serpent seek to trap unsealed believers in their own confusion as with a mantle. Satan's people betrayed their host nations in World War I. 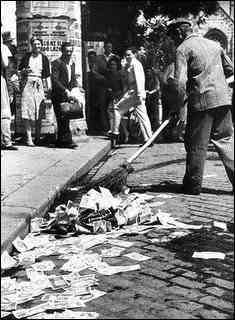 The Blood of sixty millions ran in Russia's streets; then their faux tribesmen invaded Germany and set up the Weimar Republic, created hyperinflation, stole the wealth of native Germans and turned the nation into a brothel. Since World War II they have invaded and filled every Christian and Islamic nation with filth and sin. Hence Brother Branham called the United States "the prostitute of the nations . . . and she's going to be worse than ever now. She's coming to her end. The Bible speaks of her doom . . . lowdown, rotten, filthy, no good. . . Because she's turned down the Gospel Message and rejected the truth. She's horrible. She's got it coming; don't worry. I seen it in the vision . . . She's going to pay for her sins" (Revelation Chapter Four, Part III, p. 661:87). He said, "The Angel of the Lord has appeared to me and told me, "Forget about the ameba. It's going to be all right." And I'm going to have a meeting that's going to consist of three hundred thousand people. "And God," I said, "my ministry is just now beginning." I said, "I want to base it; I want to tear that thing out from where it was, and get rid of all these here leaches, and things a hanging on, so I can get to the people and tell them what's the truth." And that's right. I said, "I'm tired of this and the man-made stuff anyhow. And I'm going to be where God can use me. I'm going to live right in that channel, as long as I live" (Early Spiritual Experiences #52-0731A). One thing is certain, the elect of God will not be deceived in the revealed Word of God (Matthew 24:24). "If the elect should hold their peace, the stones would immediately cry out" (Luke 19:40). "But the wicked will do wickedly; and none of the wicked will understand" (Daniel 12:10). Brother Branham said, "And now, remember that these things was said [in 1933]. Said Adolph Hitler would come to a mysterious end; and he would declare war on the United States; and they'd build a great concrete thing, that they'd even live in it, and right there the Americans would take a horrible beating at this. And it was the Siegfried lineeleven years before it was ever started to be built. And then said but he would come to an end, and the States would win the war" (Broken Cisterns, p. 9:52). The Jewish free Wikipedia states, "On 24 August 1944, Hitler gave a directive for renewed construction on the Siegfried Line. 20,000 forced labourers and members of the Reichsarbeitsdienst (Reich Labour Service), most of whom were 14-16-year-old boys, attempted to reequip the line for defence purposes. Local people were also called in to carry out this kind of work, mostly building anti-tank ditches. . . In August 1944, the first clashes took place on the Siegfried Line; the section of the line where most fighting took place was the Hürtgenwald area in the Eifel, 20 km (12 mi) southeast of Aachen. An estimated 120,000 troops—plus reinforcements—were committed to Hürtgen. The battle in this confusing, heavily forested area claimed the lives of 24,000 troops plus 9,000 non-battle casualties. The German death toll is not documented. After the Battle of Hürtgenwald, the Battle of the Bulge began, starting at the area south of the Hürtgenwald, between Monschau and the Luxembourgish town of Echternach. This offensive was a last-ditch attempt by the Germans to reverse the course of the war. It cost the lives of many without producing any lasting success. . . There were serious clashes at other parts of the Siegfried Line and soldiers in many bunkers refused to surrender, often fighting to the death". 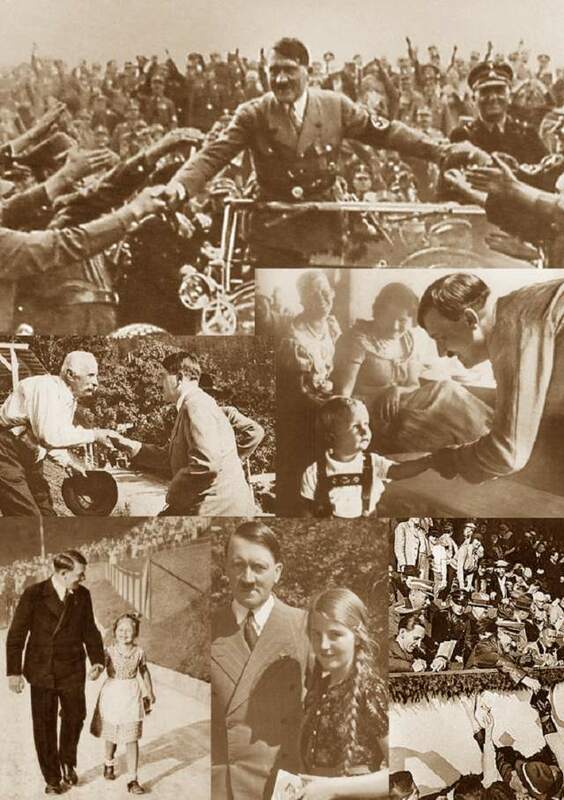 If we add 11 years to 1933, we arrive at 1944 when Hitler gave his directive. Video footage explains displays these "dragon's teeth anti-tank ditches." Brother Branham frequently confused the Siegfried Line with France's Maginot Line. President John F. Kennedy said, "Hitler will emerge from the hatred that surrounds him now as one of the most significant figures who ever livedhe had a mystery about him in the way that he lived and in the manner of his death that will live and grow after him. He had in him the stuff of which legends are made". "One day after I am long gone, you will remember me and say, we should have stopped the nuclear program of Israel, abolished the Federal Reserve and kicked all secret societies, occultists, usurpers and Zionists out of our wonderful country, to keep it that way, but it is never too late, just remember that". Many people focus on the scientific explanation, or lack thereof, surrounding the cloud. These issues pale in comparison to the real issue: Are William Branham's accounts of the cloud's formation credible? And if they are not, then where does that leave a person with respect to William Branham's overall credibility? Brother Branham must have been home in Tucson on February 28, 1963 preparing for his hunting trip, unaware of this public appearance of "the sign of Christ's imminent 'parousia' Coming," Daniel 7:9, Revelation 1:14 and 10:7. Dr. James E. McDonald of the Institute of Atmospheric Physics, University of Arizona wrote: "Approximately 175 letters have now been received from persons who observed the stratospheric cloud. Correspondence with those who indicated that they had taken photos has led to a present total of 85 photographs from 35 different localities in Arizona and New Mexico (Stratospheric Cloud over Northern Arizona; and Status of Investigation of the Northern Arizona Stratospheric Cloud of February 28, 1963). Daniel 7:10-14; Zechariah 14:4-5, Matthew 24:3, 30-31 and Luke 21:24-33 foretell a similar public sign over the Mount of Olives after the end of the Gentile dispensation. It will announce Christ's second or 'parousia' Coming to Israel heralding the "Kingdom of God" on earth for which His disciples sought before their re-birth (Acts 1:6). We go to "the Kingdom of heaven" for the Wedding Supper of the Lamb in the Sky (Revelation 19:9). 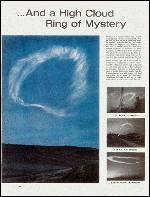 An article in Life Magazine (May 17, 1963)—"High Cloud Ring of Mystery" over Arizona—caught Brother Norman's attention while visiting and he borrowed the magazine. 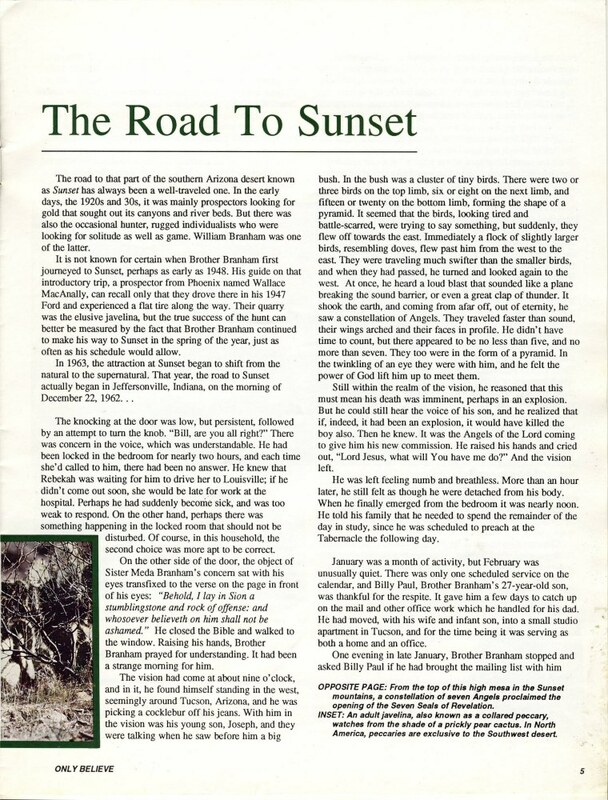 When Brother Branham came by the following Sunday to take the Normans to dinner, he recognized the Cloud as that into which he was caught up from Sunset Mountain where he was hunting with Brothers Gene Norman and Fred Sothman on about March 8, 1963. He borrowed the magazine and reported his discovery to the Church on Saturday, June 1, 1963 in his sermon "Come, follow Me," p. 2:13-16. Also see "Standing in the Gap, p. 21:82; June 23, and "Is Your Life worthy of the Gospel? p. 1:6-7, June 30. Come, follow Me, p. 2:13-16; June 1, 1963: "When I come [to Tucson], one thing, was by a vision, that [the Lord showed me in Jeffersonville on December 22, 1962 in which] I was standing above [about forty miles northeast of] Tucson up here when a blast went off. Brother Fred was there [but Brother Branham was alone picking sand burrs from his trouser legs] when it went off. [Brother Branham is speaking of the fulfilment of Revelation 10:1-4 on March 8, 1963 when he was hunting with Brothers Sothman and Norman at Sunset Mountain in the Coronado Forest]. And they [anonymous members of the public] took that picture [of the Cloud on February 28], you know, in the sky. And I didn't think much about it, never noticed it [until I saw "Life" magazine]. So it begin to impress me somehow the other day. And Brother Norman, Norma's father here, told me, said, "Did you notice this?" "And just as I looked [at the magazine], right there was them angels just as plain as they could be, setting right there in that picture. You see? I looked to see when it was, and it was time, same 'bout day or two before or, day or two after I was up there [in Sunset Mountain]. I looked where it was at: northeast of Flagstaff [200 miles nor'-nor'-west from Tucson as the crow flies], or Prescott [165 miles nor-west from Tucson as the crow flies], which is below Flagstaff. Well, that's just where we was at (See? ), just exactly." [Yes, "you was at" Tucson preparing for your hunt [in March] whereas the Cloud was 200 miles nor'-nor'-west of you as the crow flies in February]! "Twenty-six miles high; why, vapour can't go for over four miles high, or five, moisture, any kind of fog or anything. You see? Planes fly at nineteen thousand. That's to get up above all the clouds. You see? And nineteen thousand is about four miles high. This is twenty-six miles high and thirty miles across it, and in the shape of the pyramid, if you've looked at the picture [of the Cloud that appeared over Prescott and Flagstaff on February 28, 1963]." "And on the right-hand side, as I told you I noticed, outstanding, that Angel, there He is, chest out, wings back, coming right in, just exactly the way it was. I never noticed it when they first . . . There's been so many things. [In the Seventh Seal the Prophet explains the last angel was his own theophany]". Standing in the Gap, p. 21:82; June 23, 1963: "And now, I didn't know at the time, that they were taking pictures of that, scientists was [on February 28], as the Angels lowered themselves from heaven to bring the Message. And you remember, I said the one on the right side of the constellation had His—kinda chest back, and His wings . . . You remember me saying that, all of you? And how that I watched him? He was very distinctive from the others. And I didn't know [until about May 26] they were taking a picture of it, 'cause immediately [after the Cloud of Revelation 10:1-4 manifested on March 8] I hurried east [to the Church in Jeffersonville, Indiana, but probably not before March 10 or 12]. But going back home to Tucson, there it was all through the papers that had been seen almost nationwide or plumb into Mexico, all the western States. And I think the "Courier" over here . . . It was on the Associated Press. How many saw a mysterious cloud in the sky? Let's see the hands. And now, the "Life" Magazine picked it up. And I have the article here this morning in the "Life" Magazine there, of the show . . . Now, here it is, the same time I was there. See the pyramid or the Cloud? I was standing just below this. And there . . . See the distinctive Angel on the right hand side? See the pointed wing of it? Just exactly what was said. And here's interview of Mexico and different places from where they took the picture. Now, this scientist here is trying to get all the information about the picture that he can, about the people who has the picture. He's studying it". The Lord Jesus opened the First Seal nine days after this public sign appeared over Flagstaff on February 28. He daily unveiled the revelation of the Seals to His Prophet "in the little room" at Brother and Sister Wood's Jeffersonville home where he was praying and studying. He delivered the rhema of their logos from March 17 to 24, 1963 in absolute ignorance of the appearance of the Cloud on February 28, photographs or media interest, until May 26. 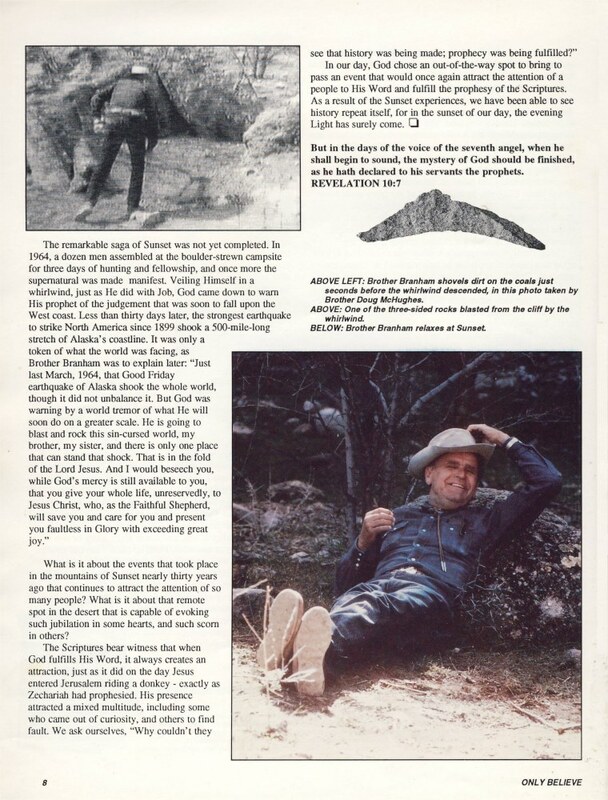 Were news of the Cloud noised abroad at that time, "Life" Magazine would have published it before May 17, or not at all. In spite of the Judaeo-Catholic church and the truly exceptional imagination of some Brothers, angels are the theophanies of human beings, without wings. 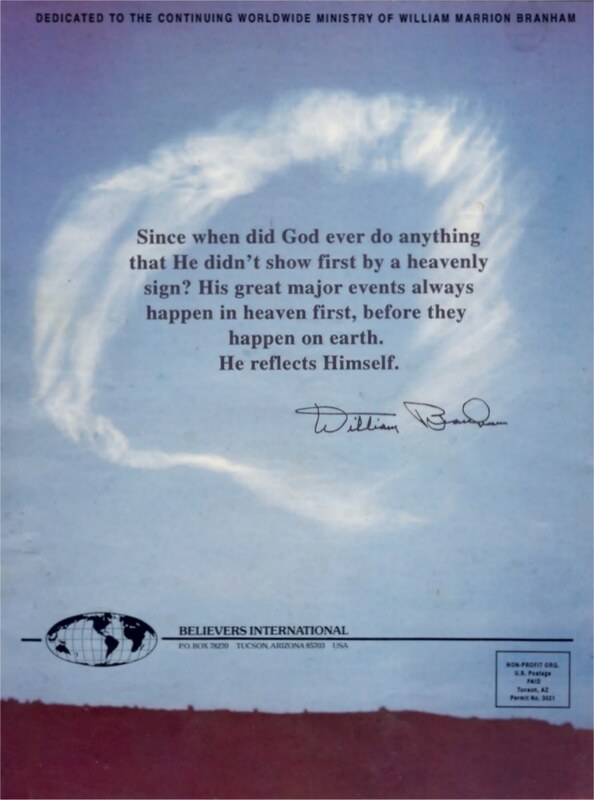 Brother Branham was referring to the swept back appearance of the Lord's beard in the Cloud as it 'flew' eastward. In Malachi 4:2 we read, "Unto you who fear My Name will the Sun of righteousness [Jesus Christ] arise with healing [restoration and glorification] in His wings [His beams are likened to the outstretched wings of a bird]; and the righteous will go forth [rejoicing] as calves released from the darkness of the stall to frisking and leaping for joy in spring pastures" (Isaiah 30:26; Jeremiah 30:17; Revelation 1:16). The evening-time Light is restoring and building faith in us for the manifestation of the Sons of God and the translation (Joel 2:25; Zechariah 17:7; Malachi 4:5-6; Matthew 17:11; 24:27-28; Ephesians 1:17-23; Revelation 10:7; 18:1). The glory of the Lord represented in this Cloud is made up of the theophanies of the seven angels and their converts, including you and every member of Christ's end-time Bride who was also present in theophany when the Lamb claimed the Book (Revelation 5:8-14). Redemption is over, and since we were predestinated to be reborn of the fullness of the Word, we were fully redeemed in Christ on Calvary. This is "that great Cloud of witnesses . . . the general assembly and Church of the Firstborn who are written in heaven" (I Thessalonians 4:13-14; Hebrews 12:1, 22; Jude 14). Is Your Life worthy of the Gospel? p. 3:12, June 30: "I'd say 8:00 o'clock or 9:00 [on March 8, 1963], wouldn't you think something like that, Brother Fred; maybe 9:00 o'clock, something? I run over on this side quickly to keep the javelinas from seeing me. They're wild boar, you know, and they're pretty scary." "So I went over the hill this way and started to run up the hill, and I just run along in a little what we call a dog trot; and all of a sudden the whole country just rung out. I never heard such a terrific blast. Just shook and the rocks rolled. And I felt like I must've jumped five feet off the ground, looked like. It just scared me. And I thought, "Oh, my . . ." I thought I'd gotten shot, that somebody . . . I had on a black hat. I thought they might've thought it was a javelina running up the mountain, somebody had shot me. It went so loud right on me like that. Then all at once something said, "Look up." There it was. Then He told me, "It's the opening of those Seven Seals; turn home." So here I come". I expect you now recognize that the pillar of Cloud appeared to the public over Prescott 165 miles nor'-west and Flagstaff 200 miles nor'-nor'-west of Tucson in the evening from around 1840hrs MST on February 28, 1963 to fulfil the requirement of Psalm 19:1. And that the same Cloud appeared a second time to the Prophet and only to him forty miles north east of Tucson between about 0900hrs and 1000hrs MST mid-morning on March 8, 1963 to fulfil his vision of December 22, 1962. It is the Rising of the Sun, p. 1:8-9; April 18, 1965: "Realizing that our time is limited here, especially for those friends who are listening in by this telephone, I would like to call your attention this morning to a picture that some time ago was taken by the camera of a vision that I had [received on December 22, 1962 and recounted on December 30] here at the Tabernacle [in the sermon, "Is This the Sign of the End, Sir?"] of leaving Indiana to [relocate to] Arizona, where I was to meet in the form of a pyramid, seven Angels. Not knowing what would happen, later when I got there, thinking it was the end of my life, that no one could stand the blast . . . (And I'm sure all of you are acquainted with the story). And then in Sabino Canyon one morning like this [at about 8.30am in early January 1963, soon after relocating to Tucson], while in prayer, there had been a sword placed in my hand and said, "This is the Word and the Sword of the Word." Later [on March 8, 1963] the Angels appeared as was prophesied [in the vision of December 22, 1962]. And at the same time, [actually without his knowledge on February 28] a great cluster of Light left to where I was standing and moved thirty miles high in the air and around the circle, like the wings of the Angels, and drawed into the skies a shape of a pyramid in the same constellation of Angels that appeared. It is essential to discern the logos from Brother Branham's rhema as he frequently conflates the two visitations of the Cloud. Whilst the appearance of the Cloud on February 28 was a public testimony, his assumption from Mount Sunset into the glorious Cloud of God's Presence on March 8 was seen and experienced by himself alone as on the Day of Atonement Israel's high priest entered the Presence alone and only he saw the Shekinah in the Holy of Holies. The main photograph in Life Magazine was taken over Flagstaff; the small pictures were taken from Prescott, Phoenix, and Winslow, a circumference of roughly 200 miles centered at Prescott. As the Cloud was twenty-six miles high and thirty miles across it would have been overhead wherever one was in that circle. Several months later Brother Branham reminded us that God always signifies major events in the heavens before they take place (Genesis 1:14; Psalm 19:1-5). He also said. "Did you notice before the Seven Seals were revealed, the great mysterious Light showed forth in the heavens up here above Tucson where we were." The Shekinah manifest as the Pillar of Cloud on two occasions and at two different locations. The first occasion was on February 28 when it appeared for a public witness seen by thousands and noted by scientists and the media unbeknownst to the Prophet until May 26. 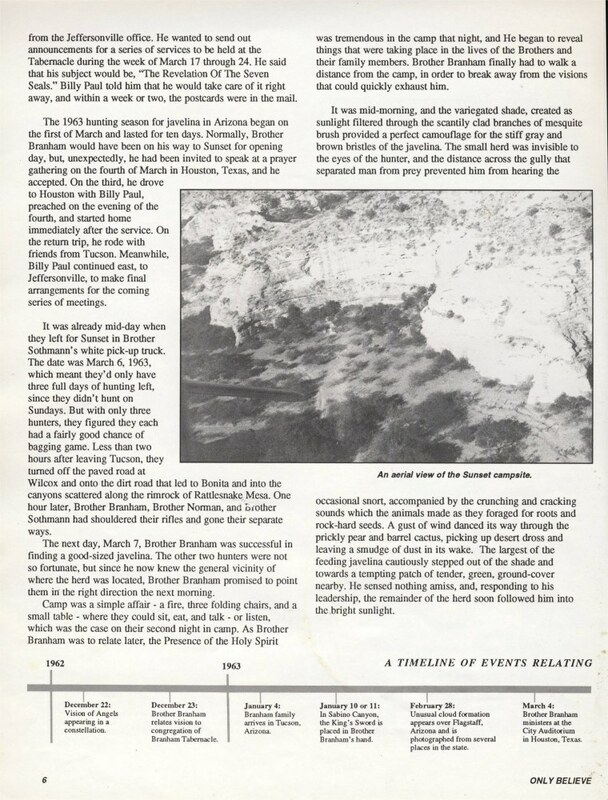 The second occasion was over Sunset Mountain when Christ opened the Seven Seals "(Is Your Life worthy of the Gospel," p. 3:13) when Brother Branham was physically caught up into the "great a Cloud of witnesses," showing the Church Ages and Christ's mediation for ignorance were fulfilled. The "constellation" or alignment of the angels' Messages of PART-Word and PART-Spirit signify "that which is perfect [or complete]" and we must "look away [from the messengers] to Jesus the Author and Finisher of our faith" (I Corinthians 13:10; I Thessalonians 4:14; Hebrews 12:1-2; Revelation 4:1-8; 6:1; 18:4). His assumption confirmed his "new commission" and he was told to return to Jeffersonville where the Lord would reveal the mystery of the voices of the Seven Thunders, which is the revelation of the unwritten Seventh Seal expounding the mystery of the six written Seals. Underestimating the Prophet's hunting prowess I reckoned this had occurred on March 9, 1963, however I later learned that his eldest daughter, our late Sister Rebekah Smith, had said that the correct date was March 8. No one but the Prophet himself saw this manifestation of the Shekinah, which he later 'recognized' from photographs of its visible public manifestation taken eight days previously. Revelation 6:1, "And I saw when the Lamb opened one of the Seals, and I heard, as it were the noise of thunder, one of the four beasts saying, Come". 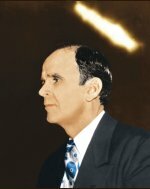 believethesign.com does not believe, but questions: "Is William Branham Credible? . . . The Scientific Explanation is: On February 28, 1963, a thrust assisted Thor rocket was launched from pad 75-3-5 at Vandenberg Air Force base in California carrying a Keyhole 4 military surveillance satellite. The rocket started to veer off course and was intentionally destroyed at an altitude of 146,000 feet at 1:52pm . . ."
Be this as it may it is irrelevant because the "blast" or single "thunder" of Revelation 6:1 and the Cloud into which Brother Branham was caught up according to the vision and dreams disclosed to the Church in December 1962 manifest not on February 28, 1963 but on March 8, unseen by anyone but God's Prophet. On January 26, 1963, before the Full Gospel Business Men's Fellowship International Convention in Phoenix the Lord spoke through his prophet expressing His complete displeasure with them and their system, "like so many others, they were now just another organization" (Revelation 3:17-20). After stating the Lord's anger, he was whirled around by the Holy Spirit in two circles, and as he left the platform he cried with a loud voice, "Come out of her My people"! Within moments the international directors were summoned to a hastily arranged executive session. There nineteen men passed a motion stating that "No longer would William Branham be invited as a speaker to FGBMFI functions." The motion passed seventeen to two. Following the passing of the motion, Carl Williams and Clay Sonmore (both executive vice-presidents of the FGBMFI) tendered their resignations if this motion was left to stand and remain on record. In deference to them as persons whose resignations might make waves, the motion was rescinded and removed from the record. Even though most of these men re-voted to remove the motion from the record, they remained convinced that the ministry of this Prophet should be curtailed and effectively side-lined. From that day they despised the Word of the Lord. They murmured against the Prophet that God sent to the church of Laodicea. On February 28 the Lord Jesus Christ appeared in the heavens wigged as a judge looking down upon Phoenix, and the Pentecostal church along with the Seven Church Ages ended on March 8. William Branham was vindicated (Investments), like Micaiah in the days of the 400 prophets of Jezebel (I Kings 22). Hebrews 10:30-31, "We know Him who said, Vengeance belongs to Me, I will repay, and also, The Lord will judge His people. It is a fearful thing to fall into the hands of the living God". After preaching "Doors in a Door" in Tucson on February 23 Brother Branham received a three-page telegram from Mr. Ted Kipperman, a Jew in partnership with a Catholic named Ayers who was married to a Jewess. These photographers were engaged by the Baptist critic Rev. Dr. Best to take his photograph threatening to skin Brother Bosworth in the auditorium of the Rice Hotel in Houston on January 24, 1950. Six photographs of Dr. Best waving his fist at Brother Bosworth were blank. God would not allow the photographers to dishonour his aged servant. The seventh photograph portrayed Brother Branham overshadowed by the Shekinah. The telegraph was a deep apology by the Jewish photographer and an appeal to Brother Branham to intercede for his sister's son who was to be executed. Brother Branham postponed his hunting trip and drove to Houston where he entreated the governor in behalf of the boy and his sentence was commuted to life imprisonment. 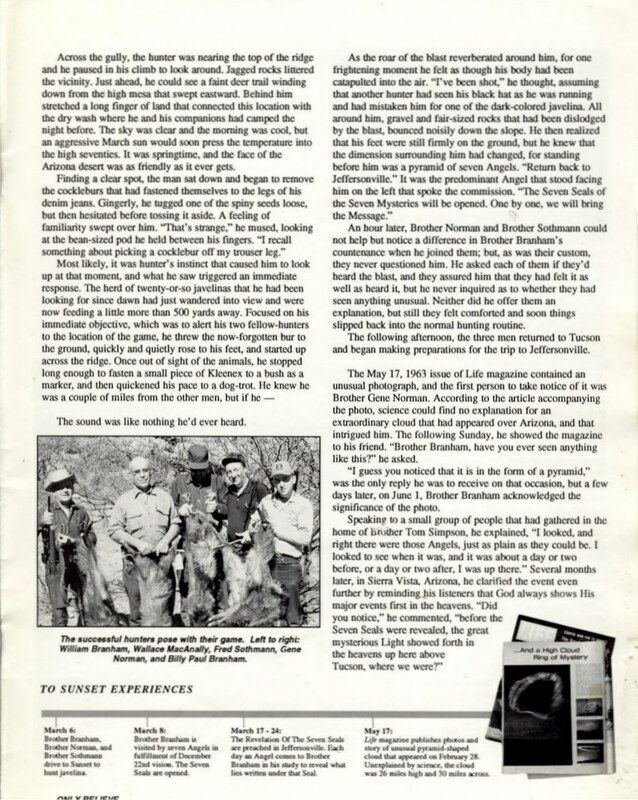 Then on March 4, Brother Branham preached "The Absolute" at a prayer meeting convened by the prison chaplain, his long time friend Raymond Hoekstra and immediately after the service he and Brother Norman drove 1,100 miles back to Tucson for the remainder of the Javelina pig hunting season which ran from March 1-10. 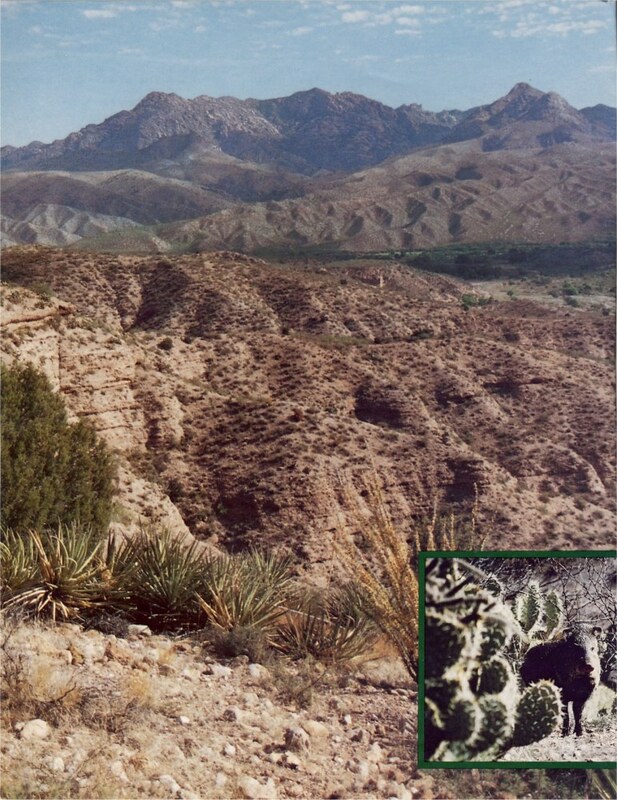 The hunting party pitched camp on March 6 and Brother Branham shot his javelina the following day, March 7, and was picking a goathead from his trouser leg as shown in the vision when the "blast" went off on March 8.